Sweeney Todd – without a doubt one of Sondheim’s most gruesome musicals – tells the story of Benjamin Barker, the so-called demon barber of Fleet Street. It is one of those shows that requires perfect casting especially for the part of Sweeney to make me enjoy it. The Royal Exchange Theatre is a unique performing space located in the middle of the Royal Exchange building and configured in the round. 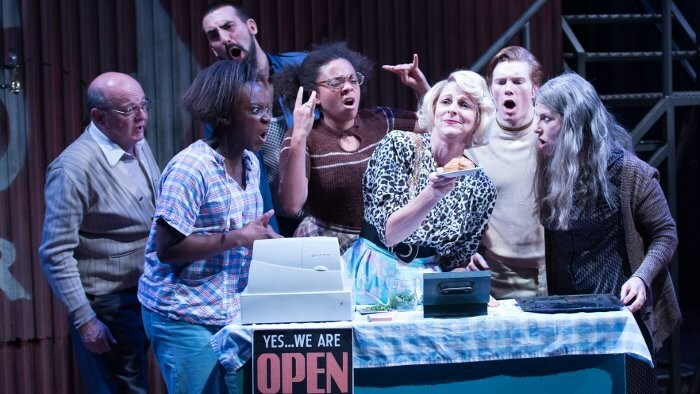 This production of Sweeney Todd had its first run at the West Yorkshire Playhouse in Leeds on a regular stage. To fit the production into the Royal Exchange Theatre the staging had to be changed completely. Since I haven’t seen the show in Leeds I can’t compare the two versions but for me the staging in the round worked perfectly. The setting of the different levels (pie show downstairs, barber shop upstairs for example) is well done in a theatre that due to its nature only offers one stage level. 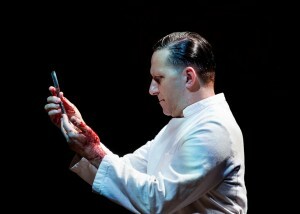 David Birrell gives what one might consider to call the performance of a lifetime as Sweeney Todd. Vocally strong he displays layers and layers of emotions – from anger to rage, sadness to despair, moments of joy to madness. His Sweeney is a maniac but he is not a one-dimensional killer. He has his motives – however crazy and out of proportion they may seem – and in order to connect with the character the audience needs to understand these motives. David Birrell manages to draw the audience in and make them actually care for Sweeney Todd. 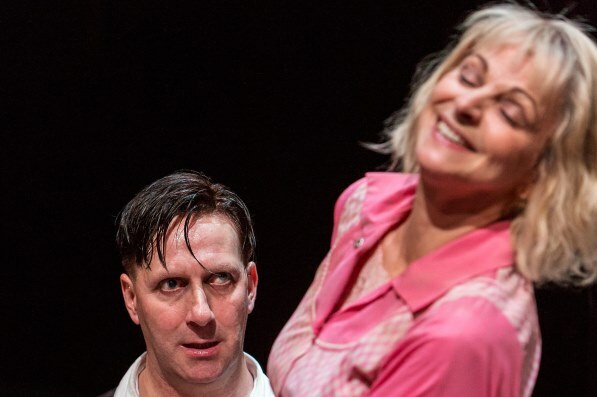 This is exactly how the character needs to be played – I was and still am in awe of David Birrell’s mesmerising performance. Gillian Bevan’s Mrs. Lovett is the perfect counterpart for David Birrell’s Sweeney. She plays the character with just the right amount of humour while not losing sight of Mrs. Lovett’s manipulative nature. I’m impressed by Sebastien Torkia as Adolfo Pirelli. The part involves some tough singing and he manages this effortlessly (or at least he makes it look like that). I’m not sure it is necessary to transform him into a Sasha Baron Cohen / Borat lookalike but it doesn’t hurt the show either. Ben Stott is wonderful als Tobias and Michael Peavoy does one of my favourite Sondheim songs of all time justice (Johanna). Speaking of Johanna, I admit I’m not convinced by Niamh Perry in the part of Sweeney’s daughter but that might have to do with the fact that it is by far my least favourite part in the show anyway. I just think her voice seems a bit shrill at times and she doesn’t come across as really innocent and slightly naive which I think is crucial for the part. Don Gallagher is wonderfully repellent as Judge Turpin – to say I was relieved of being spared of facing him in a certain scene involving a whip is an understatement. The rest of the cast does a brilliant job. Special mention for Barbara Drennan as Beggar Woman – crazed and manic but not offensive, a perfect portrayal of this small but vital character. 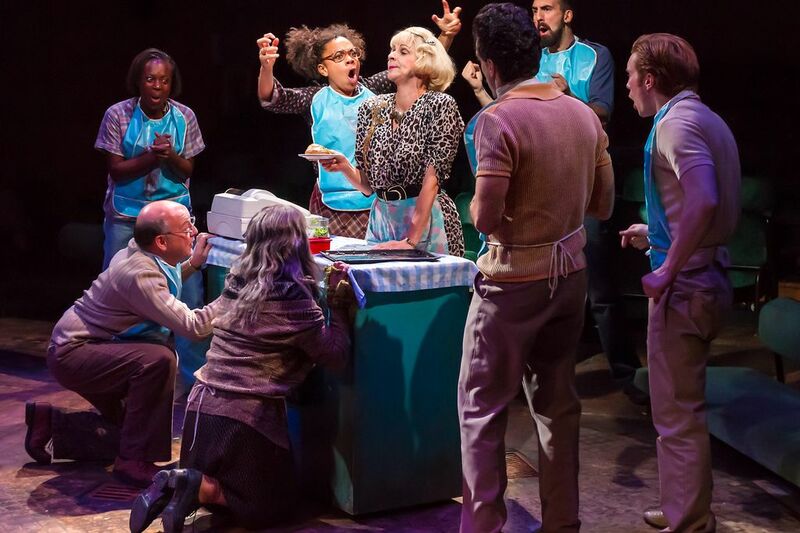 I like the modern-day setting and think the pre show is a great idea to get people in the mood for this production – I won’t spoil anything by adding more details! Sweeney Todd is not the most melodic show in parts (but then which Sondheim show is?) but it consists of some wonderful harmonies and hearing the score sung by such a talented cast is a real joy. If you think you have already seen the best production of Sweeney Todd – think again. Sadly this is a strictly limited run but if you want to see how Sweeney Todd should be performed then go and watch the show at the Royal Exchange Theatre. The run finishes on 30th November so you better be quick. For more info and to book tickets go here.